How do you order Pioglitazone 30 mg online? You can order Pioglitazone 30 mg online from YouDrugstore. We are a licensed online Canadian pharmacy, where you can purchase Pioglitazone 30 mg at the same price they pay in Canada. All you need to do is register for free on our website and then send us your prescription. Once we have received all of the necessary information from you our team of qualified health care professionals will review your order. For more convenience, ask your doctor to fax us your prescription for Pioglitazone 30 mg. When you buy Pioglitazone 30 mg from YouDrugstore we will ship your order straight to your mailbox for free. That is because we offer free shipping on any order over $100. We also offer cheap shipping prices on all other orders. Pioglitazone is a generic medication that aids in treating type 2 diabetes. 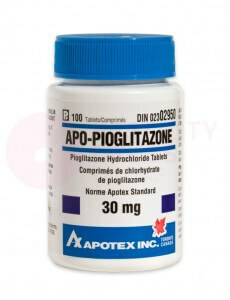 Order Pioglitazone 30 mg online from YouDrugstore today and get help treating your type 2 diabetes as soon as possible. Who might receive a prescription for Pioglitazone 30 mg from their doctor? As mentioned above, Pioglitazone is a generic drug that your doctor may prescribe to help treat type 2 diabetes. Type 2 diabetes is when your body starts having trouble processing sugar. It generally develops in those over 40 years old, who are overweight, and have a family history of diabetes. Pioglitazone should not be used if you have severe liver damage, heart problems, or heart failure. You should also not use Pioglitazone if you are pregnant, planning to become pregnant, or are breastfeeding. Never take Pioglitazone 30 mg if you are allergic to it or any of its ingredients. Why is Pioglitazone 30 mg prescribed to help treat type 2 diabetes? 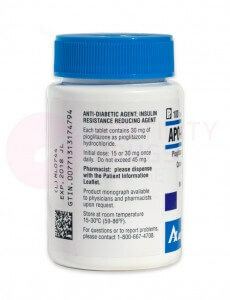 Generic Pioglitazone is prescribed to treat type 2 diabetes because it helps your body process sugar. Most other diabetes medications either provide your body with insulin or make your body produce more insulin, but Pioglitazone treats diabetes by helping the insulin you already have in your body start working properly again to process sugar. Pioglitazone is also prescribed because it is the generic version of Actos, a brand name drug that helps treat type 2 diabetes. Furthermore, your doctor may prescribe Pioglitazone simply as an aid to your healthy diabetes treatment that includes a proper diet and more exercise. Purchase Pioglitazone 30 mg online from YouDrugstore today and help make your insulin work again. What are the side effects of taking Pioglitazone 30 mg? The most common side effects you may experience when taking Pioglitazone 30 mg include edema, hypoglycemia, and an increase in weight. Edema is fluid retention, or swelling, which occurs particularly in the arms or legs and can cause an increased risk for heart problems. Hypoglycemia is a very low blood sugar level, which can also cause complications. Increased weight is possibly a sign of fluid retention when taking Pioglitazone. In most cases, these side effects are mild but speak to your doctor if you do experience them. Call your doctor right away if you experience nausea, vomiting, dark urine, blurred vision, or severe fatigue. These are rare side effects, but could be a sign of complications. Talk with your doctor if you have any concerns about taking generic Pioglitazone. When should you take Pioglitazone 30 mg? Generic Pioglitazone should be taken once every day. It can be taken with or without food, but try taking it with food if you find that it upsets your stomach. For the best results, Pioglitazone should be taken consistently and regularly. This medication is to aid your attempts at controlling your blood sugar levels with a healthier lifestyle: get plenty of exercise and remember to eat a proper diet when taking Pioglitazone. If you have any questions about when or how to take Pioglitazone ask your doctor. Where can I learn more about Pioglitazone 30 mg?